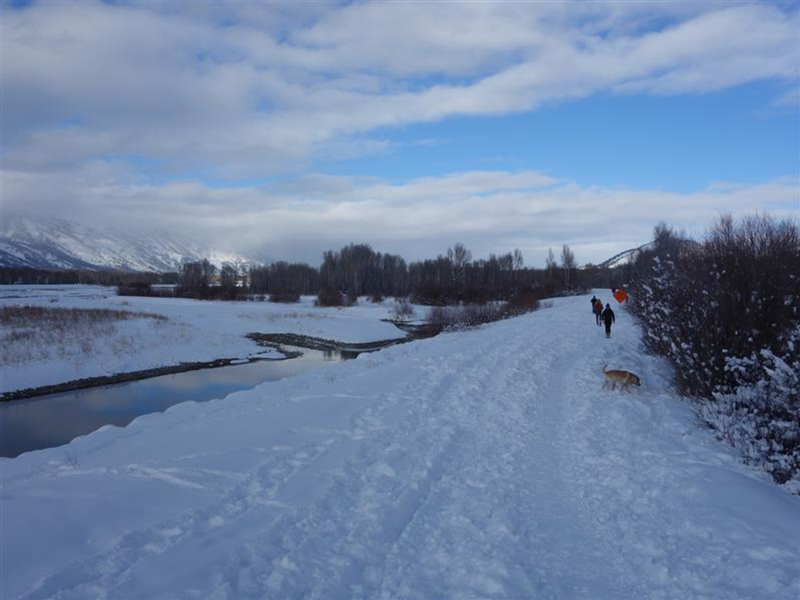 The Emily's Pond Levee offers a mellow walk, run, cross country ski, or fat bike along the Snake River between Jackson and Wilson, Wyoming. 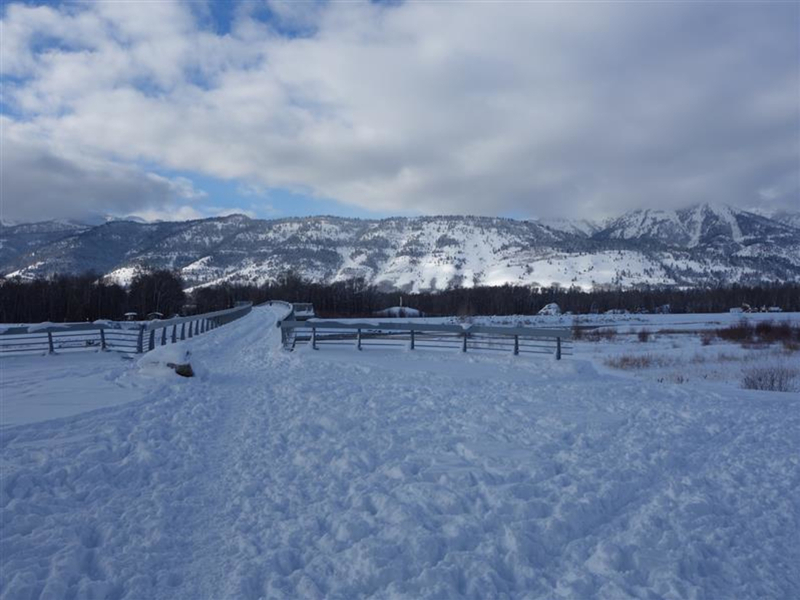 Summer or winter, the levee that runs north along the eastern bank of the Snake River starting at Emily Stevens Park, is a wonderfully scenic, mellow place for a walk or run (summer) or cross country ski, run, or fat bike ride (winter). There are two slightly trying bits: 1) all the dogs, and 2) (in winter) the short, ungroomed stretch from the parking lot to the actual levee. 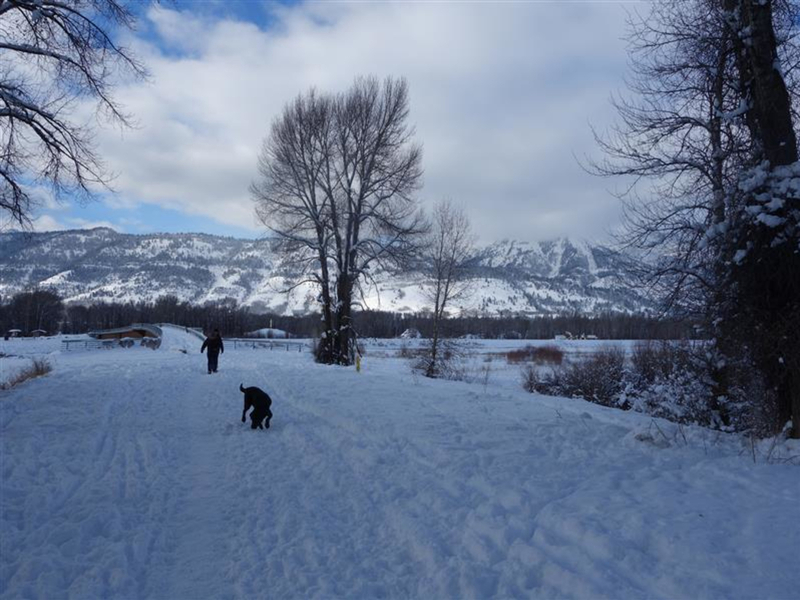 In winter, Teton County/Jackson Parks & Recreation grooms the levee itself a couple of times a week, establishing both a track for skate skiing and also a classic track. What is not groomed is the 100-meter stretch from the parking lot to the levee. As winter hikers and runners often suffer through serious postholing to get through this section, we’re not ashamed to walk it ourselves, carrying our Nordic skis. The time we tried to ski through it, we nearly broke a tip (it’s also slightly downhill). Unlike other groomed areas, there is no official prohibition of fat bikes when the track here is mushy, but fat bikers should take care to avoid riding here—and anywhere, really—when the snow is mushy. Not only does thus ruin the track for future cyclists and also nordic skiers (at least until the next time it’s groomed), but mushy conditions also make riding that much more difficult for you! At the very end of the groomed section is a short loop. Year-round moose sightings are possible anywhere along this trail. Bald eagles are a possibility too. About one-and-a-half miles up the levee there’s a bald eagle nest. You will definitely see some serious Teton views, stretching from Mt. Glory at the top of Teton Pass to Rendezvous Peak, Rendezvous Mountain (a.k.a. 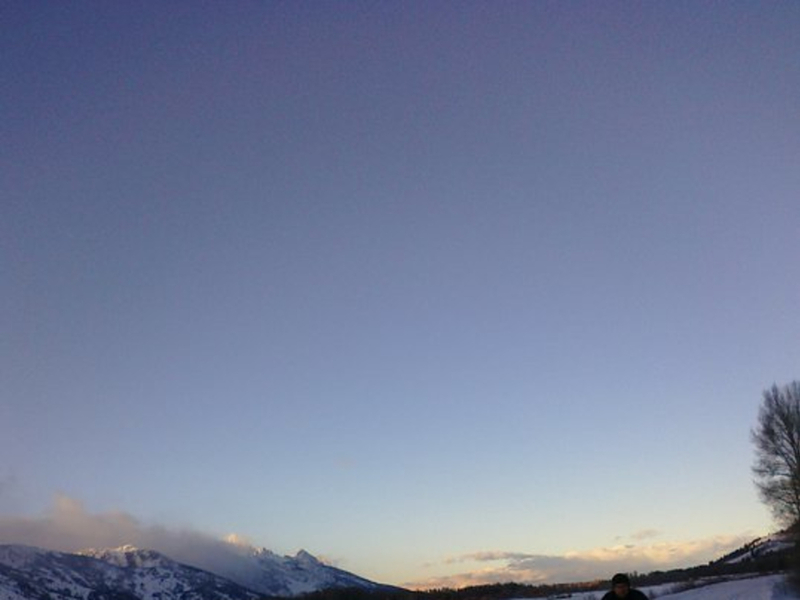 Jackson Hole Mountain Resort), Prospectors Mountain, Buck, and the Grand, at 13,775-feet the highest peak in the range and the second highest in the state. This trail is one of the few in the valley where you can run year-round. 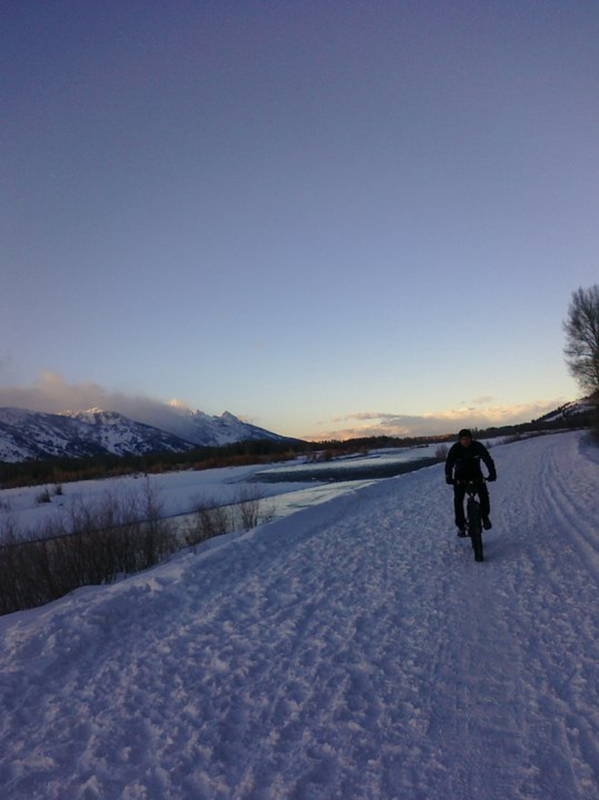 Fat biking and cross country skiing is pretty popular here in the winter. Emily Stevens park is off Highway 22, just before that highway crosses the Snake River from the Jackson side. Wilson is about two miles further on the highway. New as of fall 2014, is a pedestrian and cyclist bridge crosses the Snake here. If you want, once you cross the river, it’s a short trip to the Stilson pathway on the west side of WY Hwy 390. Stilson has about one mile of groomed Nordic trails. Saturday mornings, Stilson also has free Nordic lessons. Whatever your mode of transportation, please be careful of dogs here. Jackson has no leash laws. If you’re a dog owner, please avail yourself of the Mutt Mitts at the trailhead to pick up after your friend.